Josh Freeman made his first start a memorable one as the Buccaneers rallied to defeat the Packers. 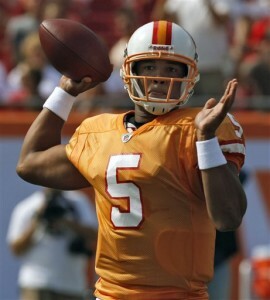 On a day when the Tampa Bay Buccaneers brought back their original orange creamsicle uniforms, first year head coach Raheem Morris and first time starting quarterback Josh Freeman got the Bucs in the win column for the first time this season with an improbable 38-28 comeback victory against the Green Bay Packers. Tampa Bay wore the uniforms that they regularly donned from 1976-1996 to honor the 1979 Buccaneers, which were the first playoff team in franchise history. They also honored LeRoy Selmon, the first member of the Bucs in the Pro Football Hall of Fame, by making him their initial honoree in the teams’ Ring of Honor. 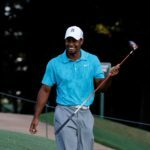 The 2009 Buccaneers will likely not be making the playoffs, but rookie quarterback Josh Freeman gave hope for the future with an impressive first career start. Trailing 28-17 following a 12-yard touchdown run by Aaron Rodgers with 12:54 remaining, Freeman and the Bucs didn’t panic. 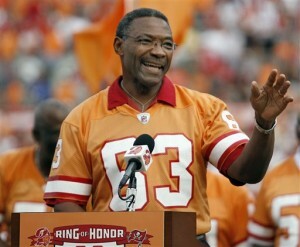 The Buccaneers honored Hall of Famer LeRoy Selmon during their win over the Packers. Instead, Clifton Smith returned the ensuing kickoff 83 yards and then Freeman hit Kellen Winslow for a seven-yard touchdown. Following a Green Bay Punt, Freeman led the Buccaneers on an eight-play, 72-yard drive to give Tampa Bay the lead for the first time on the day. Then the Buccaneers, who previously had scored on a blocked punt by Geno Hayes, showed the defensive flare that had been a trademark during their glory years. They stopped the Packers on one possession and then sealed the game with an interception and 35-yard return for a score by Tanard Jackson. Freeman finished the day completing 14 of 31 passes for 205 yards and three touchdowns. The win by Tampa ends an 11-game losing streak dating back to the final four games of the 2008 season. It also drops Green Bay to 4-4 for the season.